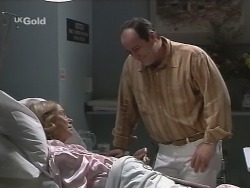 Helen telling Philip that she wants to go into a nursing home. Libby telling Cheryl that Darren knows he's given her a rough time. Steve and Danni sit down at a table at Chez Chez and Steve tells Danni that if people knew what Debbie had said, they would have been cheering Danni on. Danni, however, sighs that as far as everyone's concerned, she slapped Debbie without any reason at all. Steve tells her that tonight was the opening of her shop; it's not the Masquerade Ball. Danni exclaims that she still shouldn't have done it. Steve smiles that he didn't know she had so much passion – and there he was worried about her going up against other designers! He adds that people will forget what happened tonight. Danni, however, says they won't – not completely. Luke is ranting at Debbie that Danni hasn't changed; you can't just go round hitting friends. Debbie points out that they *did* turn up to rub Danni's nose in it, but Luke retorts that he was going out with Danni up until a week ago; he should be able to go to her opening. He sighs that Danni's let everyone down, including herself. Debbie comments that Danni's got him really wound up, hasn't she? Luke muses that she always does. Mal and Shona walk into the coffee shop, talking about the film they've just seen. Libby is sitting alone at a table but leaves them to it and heads out. Mal and Shona sit down and Shona comments that she thinks Libby has problems with Darren. Mal, however, tells her that he knows for a fact that there's nothing wrong. Shona then asks him if he'll be working at the school tomorrow and Mal nods that he will. Shona smiles that she likes spending time with him! Mal tells her that they have to spend *some* time apart or they'll have nothing left to say to each other. Shona just smiles that they can say the same things over again! A car pulls up outside No. 22 and Danni and Steve climb out. Luke and Debbie are heading up the street after going for a walk and Debbie takes Luke's hand in hers, pointedly. DANNI: Thank you – for everything. You've been really patient. STEVE: Well, it's easy when you're in love. STEVE: Come on, Danni, you must've realised by now how I feel. DEBBIE: A total and complete disaster. PHILIP (aghast): She *hit* you? 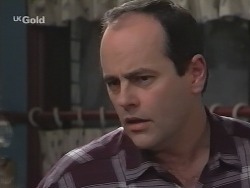 DEBBIE: She dumped Luke to go out with this guy, Steve George, and when *I* turned up with Luke it was too much for her. PHILIP: Tessa George. His wife. The next morning, Mal is having breakfast when there's a knock on the front door and he opens it to Shona. She goes to kiss him, but he sighs that he thought they'd agreed to spend some time apart. Shona, however, tells him that she figured out why he said that and she's not sick of him at *all*! Mal sighs heavily. He then tells Shona that he's got the books to do first, so he's not going to school yet. Shona mutters that she'll be early, then. She heads off, leaving Mal looking slightly fed up. LUKE: Yeah, if you still think it's a good idea. 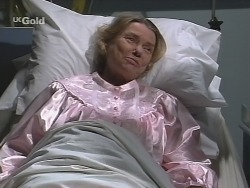 Philip tells him that Helen will be thrilled to see him. LIBBY: You think he's guilty, don't you? Mal insists that he doesn't know; maybe it was just a spur- of- the- moment thing? Libby rants that she can't believe Mal would think Darren would risk another two years in jail over something as stupid as stealing a couple of CDs. She storms out, angrily. HELEN: I'm glad you're on top of it. LUKE: Hmm! It wasn't *always* like that. At first, I was feeling really hard done by, then I got really scared, and then I got angry – but not at the disease; I got angry at *myself*. I got close to giving up. HELEN: That puts a lot of pressure on *me*, doesn't it! Danni walks into the coffee shop and bumps into Philip, who comments that he heard she had an ‘interesting' time at the party last night. Danni murmurs that Debbie said something horrible about her and Luke and she just snapped. Philip points out that whatever Debbie said, she didn't deserve the response she got. He adds that Danni should go and find Debbie and sort things out. Danni, however, says she doesn't think she can face her again so soon. Philip tells her that with them living so close, they can't go on feuding forever. DEBBIE: Hello. Mrs. George? My name's Debbie Martin – I called this morning to speak to your husband, Steve? ... Right, well, I know this isn't any of my business, but I thought that you'd like to know your husband is seeing a girl named Danni Stark. Libby is sitting alone at a table in Chez Chez when Mal comes in and asks her if she's *living* there these days. He then apologises for the argument this morning, saying he was being hard on Darren. Libby sighs that he *couldn't* have done it, could he? She murmurs that she couldn't *stand* it if he went to jail. Mal warns her not to let it wreck Year 12, but Libby retorts that she doesn't *care* about that anymore. Mal tells her that Darren wouldn't want her to throw it away. DARREN: Have you ever been able to change your sister's mind about *anything*? 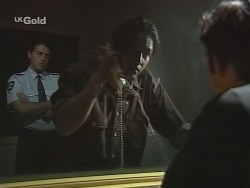 MAL: Look, you've got to try. If she's going to listen to *anyone*, it'll be you. HELEN: Where's your sense of adventure?! Philip laughs that she *is* feeling better. Helen tells him that he can thank Luke for that: he's a very inspiring young man. She then smiles that she's looking forward to going home. Philip asks if that means he doesn't have to talk her out of going into a nursing home. Helen declares that she's going to do everything she *used* to do – and when she does, she expects champagne! DARREN: There's something I haven't told you about what happened at the shop. LIBBY: You *told* me what happened. DARREN: Not all of it. There *was* a guy who left the shop before me. He didn't throw the CDs at me. I took ‘em. DARREN: Well, you're gonna have to. LIBBY (uncertainly): Why would you lie to me? DARREN: I just thought it would make things easier. It wasn't that difficult – you pretty much heard what you *wanted* to hear. LIBBY (demands): Why are you *saying* this? DARREN: I just thought you should know the truth. You're a nice kid; I just shouldn't've strung you along for so long.